In my last update, I spoke of the possible impacts of protectionist trade policy and contractionary monetary policy, and atypical source of yield as markets compress during an unusually long bull run. Now, six months later, these factors remain top-of-mind for many real estate investors. Meanwhile, the economy has largely remained healthy, with unemployment hitting a new 50-year low in September, a long-awaited uptick in real wages (3.3% annualized growth in Q3) and consumer confidence still high. The economy grew 4.2% in Q2, the highest figure since 2014. However, big swings have recently plagued the pub­­lic markets, government gridlock threatens to slow the economy and concerns over rising interest rates and destabilized global trade have not gone away. The hope among real estate investors and economists alike is that “no big news is good news” – the Fed is able to curtail inflation with continued gradual interest rate hikes, global supply chains and consumer markets are not further harmed by trade disputes, and the economy is able to settle into a sustained period of modest growth. While some markets may continue to tighten, demographic and labor trends still favor many secondary and tertiary markets. 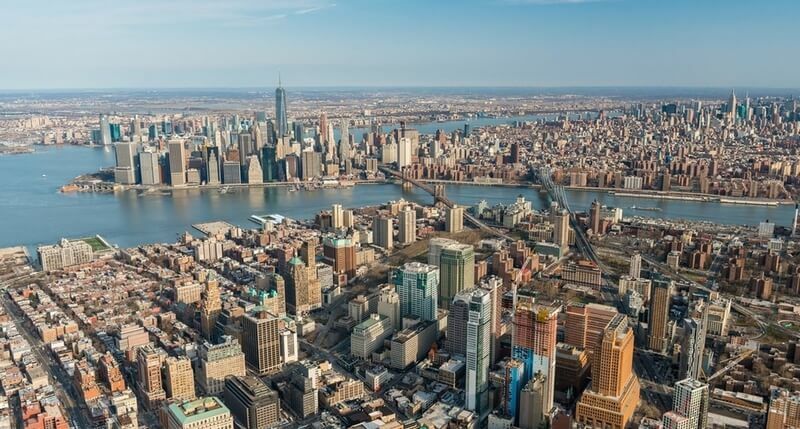 The Opportunity Zone program – a component of last year’s tax reform that has recently come to dominate real estate investing news – creates the possibility for massive capital flows into under-invested communities across the country, providing much-needed new supply and creating compelling opportunities for real estate investors. The Investing in Opportunity Act drew little fanfare when it was signed into law alongside the broader tax reform of late 2017. Sponsored by Senator Tim Scott of South Carolina, and co-sponsored by a bipartisan coalition of lawmakers and private business leaders, the bill provides substantial tax incentives to prompt greater private investment into under-invested census tracts across the country, with the ultimate goal of stimulating economic activity, distributing economic vitality more broadly across the country, and fueling a construction and renovation boom in these communities. I won’t go into all the specifics of how Opportunity Funds and Opportunity Zones are defined (a comprehensive guide can be found on our Opportunity Zone Resource Page). In short, the program allows for the deferment and reduction of capital gains tax from a recently sold investment if those gains are rolled into a qualifying Opportunity Fund, and allows investors to pay $0 in federal capital gains tax on qualifying Opportunity Fund gains if held for 10+ years. These incentives have the potential to double an investor’s post-tax return on investment over a ten-year horizon. While this program has implications outside of real estate – namely in small business equity funds and infrastructure projects – the application is most obvious in real estate, where hold periods are often long, and where there is obvious need in many of the 8,700 census tracts nationwide that have been designated Opportunity Zones. Many of the areas designated as Opportunity Zones are already exhibiting signs of growth, and with the new tax incentives should add fuel to this growth. In some cases, like Detroit, big swathes of the city are eligible. In most instances, however, it is particular sub-markets in these major metros that are already attracting investment but are still demarcated as opportunity zones – Downtown Brooklyn, East Nashville, Pioneer Square and the Stadium District in Seattle, just to name a few. The profile of Opportunity Zone investments is relatively unique: ground up construction or heavy renovation projects with 10+ year hold periods in emerging submarkets carry their own set of risks and rewards. It may seem like a contradiction, but it is my firm belief that the key to success in Opportunity Zone investing will be ignoring the tax incentives when evaluating particular projects. Each project should have a defined path to creating value and not rely on speculative market growth or tax benefits to drive returns. Despite the newness of the tax program, the fundamentals of how to look at these investments should be same as ever. The bottom line: Opportunity Fund investing carries the potential to not only generate strong post-tax returns for real estate investors, but also a real opportunity to “do well by doing good” – to contribute to economic growth in under-invested communities. EquityMultiple plans to be on the front lines of Opportunity Fund investing. For several quarters, it seemed that public equities markets could do no wrong, buoyed by consistently strong job growth figures, consumer optimism, and tax cuts. The good times never last forever, though: by the end of 2018, the S&P 500 had fallen 6.2% – its worst year since 2008, the start of the financial crisis. The Dow’s entire gains for the year were erased in a single day sell-off on October 24th, and in December the Dow fell by 350 or more points six times in one seven-day stretch. Whether or not the current stock market malaise becomes a full-blown correction or not, there are indications that market volatility will continue over the coming weeks and months, as fears of higher interest rates, trade policy and geopolitical unrest may continue to trigger slides. While some degree of correction is certain (timing of course, is not), there is little to suggest that a full-bore recession is imminent. According to a survey conducted by Bloomberg in September two-thirds of business economists expect a recession to begin by 2020, with a plurality identifying the aforementioned factors (interest rates and trade) as the biggest risk. However, the opinions expressed don’t conclusively spell doom, with responses varying as to when a recession may begin and saying nothing of how severe or how long it may last. And, amid all the stock market jitters, the government’s final Q3 figures – released Friday 10/26/18 – indicated a robust 3.5% annualized growth for the U.S. economy. While growth moderated in Q4, economists expect the final figure to be around 2.8%, roughly in line with growth in Q4 2017. As was the case when I penned my last update letter, there does not appear to be the same level of systemic risk in the economy as there was in the period approaching the Great Recession of 2008. Economic recoveries do not simply die of old age, and the odds of a recession hitting in one or two years may not be any higher than an average year – research has shown that the probability of a recession occurring in any given year is not a function of the length of a current expansion1. An optimistic and entirely plausible scenario goes that increased labor productivity – as a result of investment in new technology and a more competitive labor market at full employment – expands the productive capacity of the economy, spurring sustained, moderate growth. Jerome Powell picked up where his predecessor left off: orchestrating interest rate hikes that are gradual and predictable. The Fed has raised its benchmark federal funds rate nine times since 2015, most recently on January 9th, 2019. While we expect more rate hikes in the coming year, several high-ranking Federal Reserve officials have expressed opposition to further pre-ordained rate hikes, vowing to take a measured approach and consider financial market input in the months to come. As interest rates rise, so too does the cost of borrowing money, dampening leveraged real estate returns and slowing acquisition activity. However, rising interest rates do not occur in a vacuum – the Fed’s consistent rate hikes have come in response to consistent and robust economic growth, and to help prevent runaway inflation. In general, the economic growth and high rates of employment driving Fed policy is also good news for real estate investors. In other words, gradual increases in interest rates hardly spell doom for real estate markets, it simply changes the playing field. In the short term, cap rates will compress and yields will tighten. However, if rates continue to rise, cap rates will have to rise with them, putting downward pressure on exit values. In some cases, raising rents will compensate for this downward pressure. While raising cap rates put downward pressure on the exit value of existing investments, it should spell higher yields for new investments as the market adapts to higher cap rates. While this market dynamic plays out, EquityMultiple has increasingly turned to debt and preferred equity investments, where changes to cap rates are less likely to impact investment returns. We also continue to look for sub-markets exhibiting strong growth, often spurred by underlying demographics, to offset raising rates and more niche property types, where they are able to generate outsized yield. You may have noticed some of our offerings in these more niche property types. Flexibility, affordability, and community are current themes in the multifamily space, giving rise to new sub-asset classes. With homeownership rates still near historic lows, and desirable urban cores inaccessible to mid-career professionals, the “co-living” model pioneered by StarCity and other companies is gaining traction. Similarly efficient, transit-accessible “micro-unit” properties can attract a diversity of tenants – from the middle and lower-income workers who make up the backbone of a local economy to higher-income owners seeking an additional space in a city, a nightly rental property, or both. From an investor’s perspective, both these strategies are able to target a higher price per square foot than traditional residential units and thus a higher return. EquityMultiple remains committed to sourcing, vetting, and curating a diverse set of investment opportunities across markets and property types and spanning the entire capital stack. 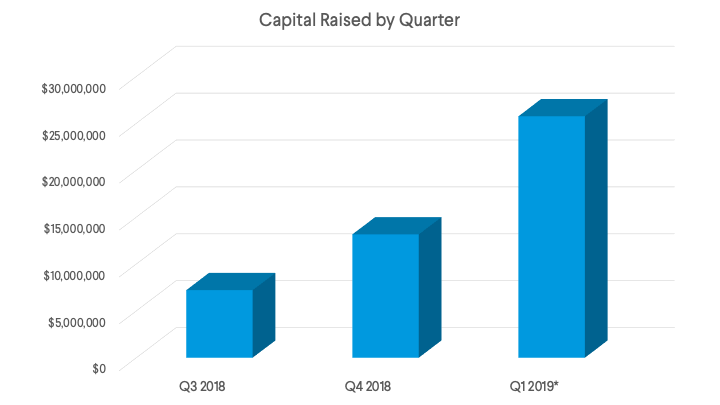 As you may have read, EquityMultiple raised $3M in private equity capital in order to grow our team and continue to build great technology, adding new features and offerings to our platform. Over the past few months, we’ve been thrilled to welcome a number of bright, committed, experienced folks to our team. More details and bios can be found on our About Us page, but in brief: we are scaling our team with a focus on Investor Relations, Asset Management, and deal underwriting. Investors should certainly take heart in our ongoing commitment to these facets of our business. As of January, we have closed on 51 transactions across 30 markets. Our investors have contributed over $49 million to commercial real estate projects with a total aggregate capitalization of over $790 million. Q4 2018 was our highest-volume quarter on record, with $13.2 million invested across 5 offerings – a 83% quarter-over-quarter increase in dollars invested. We expect to significantly outpace that in Q1 2019. In 2018, we selected approximately 5% of the investments we evaluated and we remain focused on quality over quantity, on scaling our portfolio of offerings gradually and responsibly. That said, our real estate team is working hard to provide a steady flow of diverse commercial real estate investments to meet investor demand. The average raise size of our offerings increased over 200% from 2017 in 2018 to accommodate growing investor demand. In 2019 we will continue to deliver the same quality of deals and investor experience as we scale our business. Highlighting the strength of our investments was a major initiative for the team in 2018. As a result, we were proud to introduce our Investment Tracker. The tracker is a great tool for providing investors insight into our overall performance, as well as by property type, geography, deal type, and strategy. We believe maintaining and improving our Investment Tracker is a fundamentally important part of maintaining our commitment to transparency and welcome feedback from investors. Portfolio overview: Of the 51 total investments to date, 10 investments have been fully realized and 28 have been generating distributions to investors. Our latest acquisition is expected to join that group in Q1 2019. Remaining portfolio investments include transitional properties and projects in their early development cycle. Average investment yield: Across all cash-flowing investments* – measured from their first payment period – average current yield is 8.61%. This does not include any accrued payments or profit sharing, features of many of our preferred equity and equity investments. In 2018, we doubled the size of our Research & Development team to continue building best-in-class products with non-stop innovation. Our focus is on making the EquityMultiple platform even more efficient and useful, while never compromising on security standards. We strive to let our product do the talking. In the last quarter of the year we delivered several features and optimizations for Investors. Investors can now link bank accounts faster through Instant Account Verification (IAV). IAV is an option for bank verification, separate from verification through micro deposits. This means saving time and funding an investment more easily. Have you opened a new bank account and want to receive distributions to it? IAV makes this quick and painless. Adding staff to our Asset Management team has increased the speed at which we can send you important deal updates. This, in combination with various performance improvements, makes finding out information about your investment easier and faster. We also continue to improve the Portfolio page, so you can better understand the performance of your EquityMultiple investments. We’ve added a feature to your Portfolio which allows a full download of all distributions by investment. Download to CSV, and open in Excel to visualize and manipulate in any way you want. Generating Quarterly Statements for each of your accounts. You’ve asked for the ability to download PDF versions of your statement, showing performance and cash flows for that period – we’re looking forward to delivering it. The ability to filter your portfolio by account (e.g. ‘joint’ vs. ‘individual’), and other filters. View your portfolio from multiple angles, and see how your strategy and performance aligns by account. Our first priority is to ensure a safe experience. With this in mind, we are rolling out key updates to security in our application, including two factor authentication and new device authorization. In addition to these more obvious upgrades, we’re working on several Administrative improvements. While you may not see these improvements first-hand, they will help our Investor Relations and Asset Management teams provide you and your accounts better service, not least of which is to provide better distribution control for faster payment. This memorandum expresses the views of the author as of the date indicated and such views are subject to change without notice. EquityMultiple has no duty or obligation to update the information contained herein. Further, EquityMultiple makes no representation, and it should not be assumed, that past investment performance is an indication of future results. These materials contain projections and other forward-looking statements. Any statements that are not historical facts are forward-looking statements that involve risks and are inherently uncertain. Moreover, wherever there is the potential for profit there is also the possibility of loss. This memorandum is being made available for educational purposes only and should not be used for any other purpose. The information contained herein does not constitute and should not be construed as an offering of advisory services or an offer to sell or solicitation to buy any securities or related financial instruments in any jurisdiction. Certain information contained herein concerning economic trends and performance is based on or derived from information provided by independent third-party sources. Equity Multiple, Inc. (“EquityMultiple”) believes that the sources from which such information has been obtained are reliable; however, it cannot guarantee the accuracy of such information and has not independently verified the accuracy or completeness of such information or the assumptions on which such information is based. This email message is intended only for the recipient to whom it is addressed and may contain information that is privileged and confidential. If you are not the intended recipient of this message, any use, dissemination, distribution or copying of this communication is strictly prohibited. If you have received this communication in error, please immediately notify the sender and permanently delete all copies that you may have. EQUITYMULTIPLE does not give investment advice, endorsements, analysis or recommendations with respect to any securities. Nothing contained in this email constitutes tax, legal, insurance or investment advice, nor does it constitute a solicitation or an offer to buy or sell any security or other financial instrument, which only can be made through official offering documents that contain important information about risks, fees and expenses. Any investment information contained herein has been secured from sources EQUITYMULTIPLE believes are reliable, but we make no representations or warranties as to the accuracy of such information and accept no liability therefor. Securities are offered through Growth Capital Services, member FINRA, SIPC, Office of Supervisory Jurisdiction located at 582 Market Street, Suite 300, San Francisco, CA 94104. We recommend that you consult with a financial advisor, attorney, accountant, and any other professional that can help you to understand and assess the risks associated with any investment opportunity. Charles is the CEO & Co-Founder of EquityMultiple. He is responsible for shaping the strategic vision of the company and overseeing its daily operations.